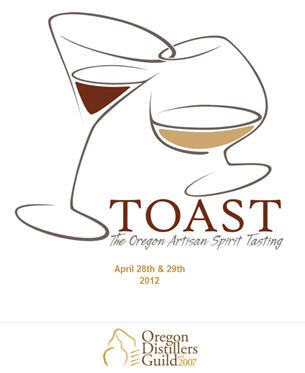 This past weekend was TOAST (The Oregon Artisan Spirits Tasting), an event put on by the Oregon Distiller’s Guild (like them on Facebook here) and touted as the largest craft spirits tasting in North America! The event featured over 55 local and national artisan producers, all told pouring over 170 different unique spirits. How, I ask you, as a founding 3DC member can I pass this up… I mean it is almost an imperative that I go, learn, taste, and report back, right? Well, I’m not going alone, so I dragged Jean and Corey along with me (ok maybe not dragged, more like enabled). This is the same event where last year my friend Corey and I met Ted Pappas of Big Bottom Whiskey along with a few others, so I was very pleased to see some great whiskey representation by even more makers and distillers this year. It seems our local craft artisans are really doing some great work and growing by leaps and bounds. The event itself also seemed to indicate this with a shift in venue to the Portland World Trade Center as well as the critical addition of an on-premise bottle shop. From my view as an attendee, the addition of the bottle shop was the perfect compliment to the tasting hall as we were able to immediately buy bottles we enjoyed, without the burden of having to remember them for later 😉 I can only hope the addition of the on-premise shop proved beneficial for the vendors as well since the convenience of purchase would likely make for some good sales likely missed if an attendee would have to go searching their local stores for some of these bottlings. Since this is a whiskies blog and tasting group, I won’t bother with the details of all the other spirits we tasted on Saturday, instead will focus on just the whiskies side. You’re also in luck, as I didn’t bother with my normal tasting notebook, you’ll not have to bear through the specific tasting notes of each dram I had, which given the expanse of the event is likely a good thing for us all! Our initial whiskey of the day was Cabin Fever Maple Whiskey which is an 80 proof maple infused rye whiskey that is aged in uncharred barrels and then chill filtered to remove excess sugars. This one was simply too sweet for my palate to be a sipping whiskey, and really struck me as the perfect cooking ingredient (or breakfast dram to pour over your pancakes if’n you swing that way). Next we moved on to Dry Fly Distilling where we sampled their Washington Wheat Whiskey. I recall discovering Dry Fly a few years back at Whiskies of the World where they were pouring what must have been thier first commercial run of the Washington Wheat. I’m happy to note here that they’ve really begun to fine-tune the dram and are producing a very pleasant, very smooth wheat whiskey that eschews much of the bitterness of corn based mashes leaving a nice soft story the whole way through. Luckily we were able to peel away and head off to more vendor tables, this time stopping at Ransom Spirits to sample their Whippersnapper Whiskey. This was an interesting one to me as it uses two different base distillates: one Kentucky whitedog corn based mash which is re-distilled, and the second being a recipe of malted and unmalted barley mash distilled in Oregon. This combination, as well as the use of use bourbon barrels and their own Pinot Noir barrels makes for an interestingly complex dram that still has the soft sweetness you’d expect from an American whiskey but without the bitter finish so many bourbons can leave you with after aging. The year average in the barrels definitely does this dram right. A hop over to Few Spirits caught us a bit off guard as we found their Whitedog whiskey to be better in flavour and finish than their aged bourbon. If I recall correctly (I’ve been unable to verify this online *edit below because I was wrong*) the whitedog is actually made with a mash created from Oat flour rather than solid grains. Whatever the case, this whitedog is one that is just as easy sipping as any of the bourbon and American aged whiskies in the rest of the show. Truly a happy surprise. *Edit* I knew I kept Corey around for a reason 🙂 He just informed me that Few Spirits was unaged only, with the interesting gin along side. The aged at that table was Old Pogue, which was good, but the unaged still won me over. It was actually Stone Barn Brandyworks which was the source for the oat flour based whiskey. Their 100% rye was the one better as unaged. Both were surprising and wonderful drams to be had. If you find yourself in Portland, they are a must try. Thanks for the updates and corrections, Corey! Next was Mischief Spirits where we sampled both their Fremont Mischief Whiskey as well as their John Jacob bottling, both rye spirits. This stop exemplified for me that most American whiskies do best aging between 1 and 8 years, no longer. I say this as their Fremont Mishief whiskey is aged eight years and to my palate was on the way down from what may have been a peak aging at 6 years, leaving me to prefer their John Jacob offering which I don’t recall showing any age statement, most likely around 12- 24 months in the barrel. While both were good, John Jacob came out the clear top to me. Next, we moseyed across to Eastside Distilling, where we sampled their Burnside Bourbon. I was pleasantly surprised by this bourbon, as it finished quite smoothly without hint of the bitter finish I’ve come to expect from high corn based mashes. Unfortunately the two reps manning the table weren’t able to provide more specifics on the mash bill, so I was unable to verify if it truly was a high percent corn mash or if it had a substantial rye content. Surprisingly (or not) I didn’t even noticed that it is bottled at 96 proof… that either tells you how soft it really is or how much I’d had by this point. To round out the day we finished off at Bull Run Distilling since I was already very familiar with their Temperance Trader Whiskey. It should come as no surprise that I enjoy this ‘high rye’ whiskey given the commentary above. Like Big Bottom, this bottling from Bull Run is not distilled on premise, but rather is a selection of distillate from outside sources. Given the selection that the boys at Bull Run have made, I’d say our palates are very much in line, as this is a wonderful dram to sit back and sip, or to add in as a base for some outstanding cocktails. Plus, Lee and Patrick are good guys to chat with, obviously passionate about what they do, which is brilliantly obvious in their on-premise distilled vodka and rum, both which drink as if they were top shelf whiskies. Also doesn’t hurt that they open their doors to Stuart Ramsay for his Whisky Academy series of lectures and tastings… makes for building a nice little community and connection between enthusiasts and the creators. 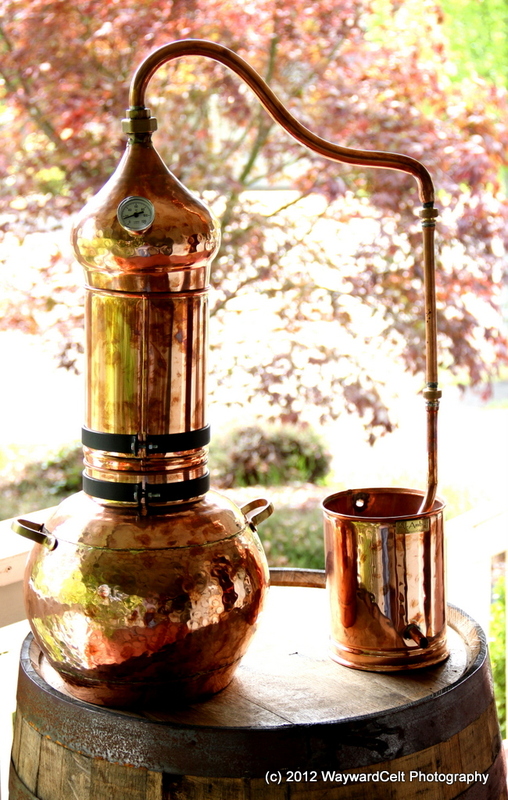 I guess I’d be remiss if I didn’t share a picture of my lovely new decorative purchase from Essential Oil, another local shop… yes, I might have a thing for copper, why do you ask? This entry was posted in American, Events, Misc. Events, Misc. News and tagged alembic, american whiskey, angels envy, artisan, big bottom, bourbon, bull run, cabin fever, copper, craft, distilleries, dry fly, eastside, few, mischief, oregon distillers guild, ransom, rotating column, still, TOAST. Bookmark the permalink. Thanks so much for the kind words about Angel’s Envy. I can assure you that it is a labor of love, crafted by three generations. Nothing better to us than the affirmation that we are on the right track, and that folks (like you guys) who have such a love for bourbon enjoy our little brand. Thanks for the comment Wes! I gotta say, it’s people like you and your dad, Lincoln, that help keep that passion alive both within the industry and at the consumer level. You’re doing great work!